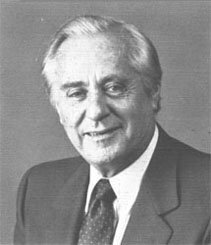 Curt Gowdy: It was in Cheyenne, Wyoming. I just got out of the Air Core and went into the Mayo Clinic to have a spinal operation. When I came back home they told me I shouldn't work for six months. About three or four months into the recovery period, a local radio station in Cheyenne called me and said they had a football game the next day and they wanted to know if I would broadcast it. I told them that I had never broadcast anything in my life and I didn't know anything about it, but the manager said he knew that I played basketball at Wyoming and I was a sports person. Also, if I didn't do it, he and his wife would, since there was no one else around because it was during the war in 1943. I told him I would call him back with an answer and after thinking it over I decided to do it. I went down to a vacant lot at 7 am the next morning and there were two soap boxes sitting there and an old fashioned mike. There was a kid standing there so I walked up to him and he introduced himself. He said he was there to do the commercials. Apparently, they sold the game for $50 to 10 sponsors and they would pay me $5 to do the game. I looked out onto the field and there were no yard lines, goal lines or side lines. Just two goal posts. Just then, a school bus drove up and let out the two teams. One was from Pine Bluffs and the other was St. Mary's, a small Catholic school in Cheyenne. I asked the coaches for the team rosters but they didn't have them. The next thing I knew the whistle blew and the game had started. I ended up making up the whole game and all the names of the players. I used names of players I played basketball with and guys who were with me in the Air Force. I got home that night and the station manager called me and said, "You're a natural play-by-play announcer. Would you like to do our high school basketball games this winter?" I told him I would since I needed something to do and that was the start of my career in broadcasting. In the future, when I would be doing the Rose Bowl, the Super Bowl or the World Series, I would think back to that vacant lot and those two soap boxes and realize how lucky I was to get started in broadcasting. CG: In 1950, Red Barber, who was the Sports Director of the CBS Radio Network, called me up and said they were going to have a new show called "College Football Scoreboard" and he'd like me to do it. I said okay and for 13 weeks every Saturday I'd go over there and do this football show. After the third or fourth week, I was about a half-hour before I was ready to go so I headed over to the studio. The studio was about eight or nine floors above the Sports Department so I pushed for the elevator and I waited and waited but it never came. I decided to walk up so I went into the stairwell and walked up there but the door was locked. I started banging on the door but nobody answered. I looked at my watch and it was about six minutes to six and here I am with this great opportunity to broadcast coast to coast and I'm stuck in the stairwell. I decided to run down to the floor I was on before and I heard someone yelling, "Gowdy, where are you?" "They're waiting for you upstairs." When I got down to the floor they had the elevator waiting for me so I rushed up with about 30 seconds until the show started. I had my script in my hand and I sat down but I couldn't say anything because I was out of breath. I pointed to the announcer to introduce me and I made the worst ad-lib in the history of radio. I said, "Ladies and gentlemen, a funny thing happened to me on the way to the studio. I got stuck in the stairwell." The people must have thought I was crazy or drunk or something. Finally, I took a deep breath and started to read the script and I was alright. After the show I thought I was finished. On Monday morning, Red Barber called me and said, "Young man, you must remember in radio the second hand is always ticking. You should have been in that studio when you were supposed to." After I told him what had happened he was very understanding and told me that he hoped wouldn't happen again. CG: They had a day for me in Wyoming, "Curt Gowdy Day," in 1972. There was a big banquet and they named a state park after me. They also gave me an Honorary Degree in Law from the University of Wyoming. They said I could bring some people with me so I asked Howard Cosell if he would like to come. He said they wouldn't like him because he was a Jew and there were no Jews in Wyoming. I told him that was crazy and finally convinced him to come. When we got there, there were a lot of people at the airport and they had these cars waiting for us. What we didn't know is that we left our wives at the airport. Mrs. Cosell and Mrs. Carl Lindeman, the wife of the President of NBC Sports, rode a foot truck into town. Howard never forgave me for that. That night, they had a big banquet. There had to be 1000 people there. About a half-hour before the banquet, Cosell called me and said he had to talk to me. He was really worried about giving a speech because he was Jewish and people might not like him. I told him he was crazy and that these were really nice people and everything would be fine. During the banquet they called him up to speak and he spoke for about 10 minutes and afterwards he sat down and there was dead silence. All of a sudden the whole crowd rose and gave him a standing ovation. Cosell was so overwhelmed that he started to cry. So I turned to him and said, "See, and you thought people from Wyoming didn't like you." CG: Boston. It's a great town. Who would of thought that a kid from Wyoming would live in Beantown but we love it. My wife and I raised our kids there. LS: What do you think of the current state of a sports? CG: It's so different now. Everything is money. Big team payrolls. The inefficiency of small market teams trying to compete. The Yankees have a payroll of $107 million. Other teams have payrolls of $28 million. How can they compete? It's a shame that money has become such a big factor and the players are so obscenely rich. But nobody tells the owners they can't give it to them. There's no rules. That's the biggest difference now is that money runs the whole thing. LS: Do you think team owners are too easy on players who break the rules? CG: They've got to do something about the inequity of the little markets competing with the big markets. The Yankees get at least 50 or 60 million dollars alone form cable and they're going to get an even better deal on their next contract. Markets in Minnesota, Kansas City get two or three million. So how can you compete with them. They have to do something about that. They just had a blue ribbon panel study where they said they've got to do something to reward the smaller markets to give them a chance to compete more evenly. Also, if need be, if the club is not doing well, like in Montreal, move the franchise. That's the main thing. I don't see too much wrong with the NFL setup or the NBA, but baseball has got problems.